Tape Worm Tabs® (praziquantel) for Cats in a tablet form. This product removes the common tapeworms, Dipylidium caninum and Taenia taeniaeformis, from cats and kittens. Tapeworms are one of the most common parasites seen in cats and kittens. 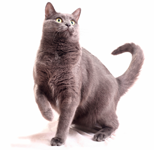 Tapeworm Tabs for Cats are safe and effective in removing tapeworms. Where pet owners find fleas, they’ll find tapeworms. Fleas are carriers of tape worm eggs. Your pets may ingest the flea and become infected. A treatment using Frontline can be used to break the flea life cycle at the egging stage to prevent and control the flea infestation. 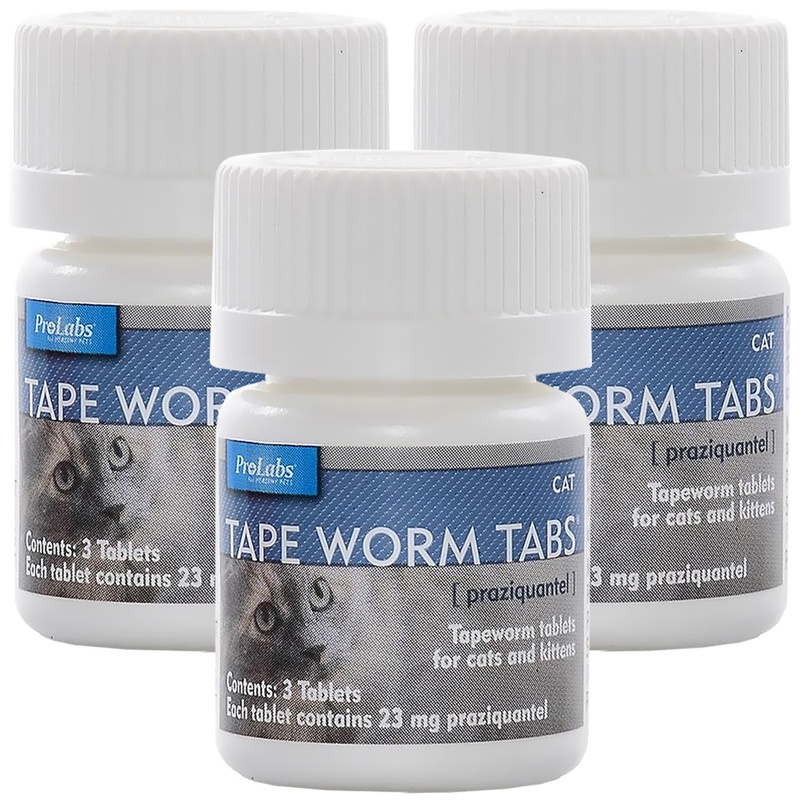 Pet owners can use Tape Worm Tabs to treat their cats and kittens of worm infestation with veterinarian-preferred Tape Worm Tabs. The only FDA approved Praziquantel for over the counter. Cats become infected with tapeworms after eating fleas or small rodents (rats, mice) which are infected with tapeworm larvae. 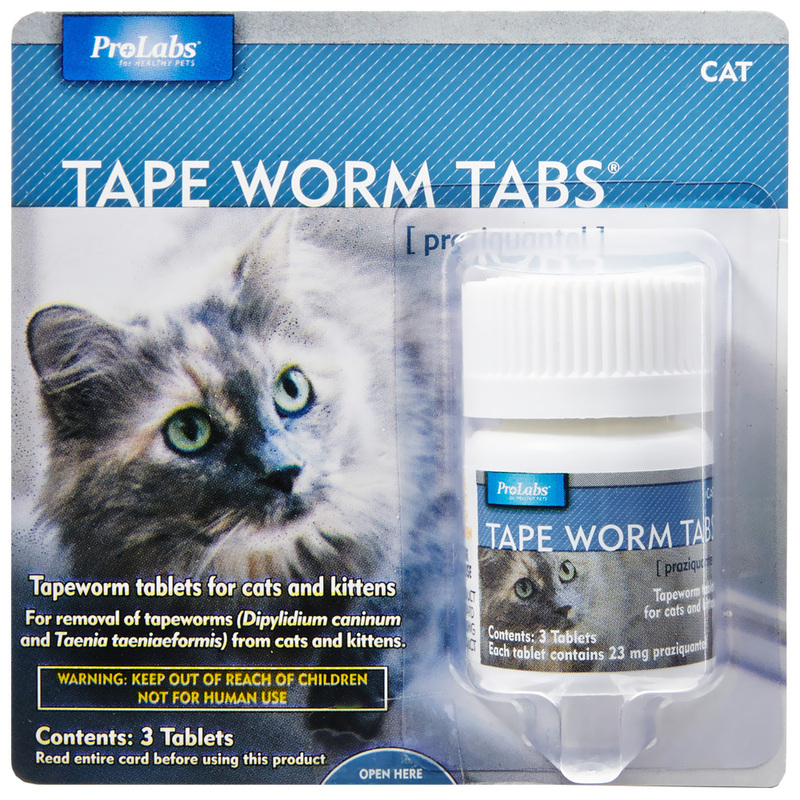 Tape Worm Tabs® (praziquantel) for Cats are sized for easy oral administration to adult cats or kittens, 6 weeks of age. The tablets may be given direly in the mouth or crashed and mixed with the food. If given with food, mix the tablet(s) with a small amount of the animal’s usual meal. If all of the tablet(s) is/are not eaten, Tapeworm Tablets may not work or remove all tapeworms. Each bottle contains 3 tapeworm tablets. Flea infestation will cause the cat to bite or chew an itchy area. When the tapeworm egg carrying flea is swallowed by a cat, the eggs are ingested and develop into larvae, the larva changes into tapeworm. The tapeworm gets its nutrition from the food that passes through the cat. Tapeworms can grow quite large inside your cat’s intestine. 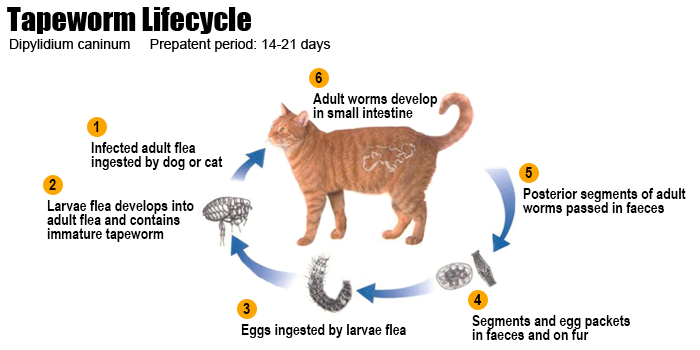 The tail end of the adult tapeworm will break off and gets released with cat’s feces, usually on surface of stool. Discover the dangers of parasitic worms. Treatments for fleas and ticks. 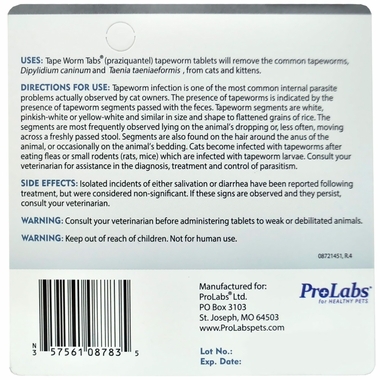 Praziquantel is used to treat infestations of schistosoma (a type of worm that lives in the bloodstream) and liver fluke (a type of worm that lives in or near the liver). Praziquantel is in a class of medications called anthelmintics. It works by killing the worms. Praziquantel works by damaging the parasite's skin internally so the parasite disintegrates and is removed by the pet's immune system. Remove the common tapeworms, Dipylidium caninum and Taenia taeniaeformis, from cats and kittens. To prevent harm to you and your pet, read the entire label and enclosed directions before each use. Follow all directions and precautionary statements carefully. Avoid contact with eyes, and wash your hands thoroughly after each use. It’s important to remove all fleas on your pet because your pet can get tapeworms from swallowing tapeworm egg carrying fleas. Steps should be taken to control fleas on the premises in order to prevent reinfection. Otherwise, retreatment will be necessary. This is especially true in cases of tapeworms transmitted by fleas (Dipylidium caninum) where reinfection is almost certain to occur if fleas are not removed from the animal and its environment. 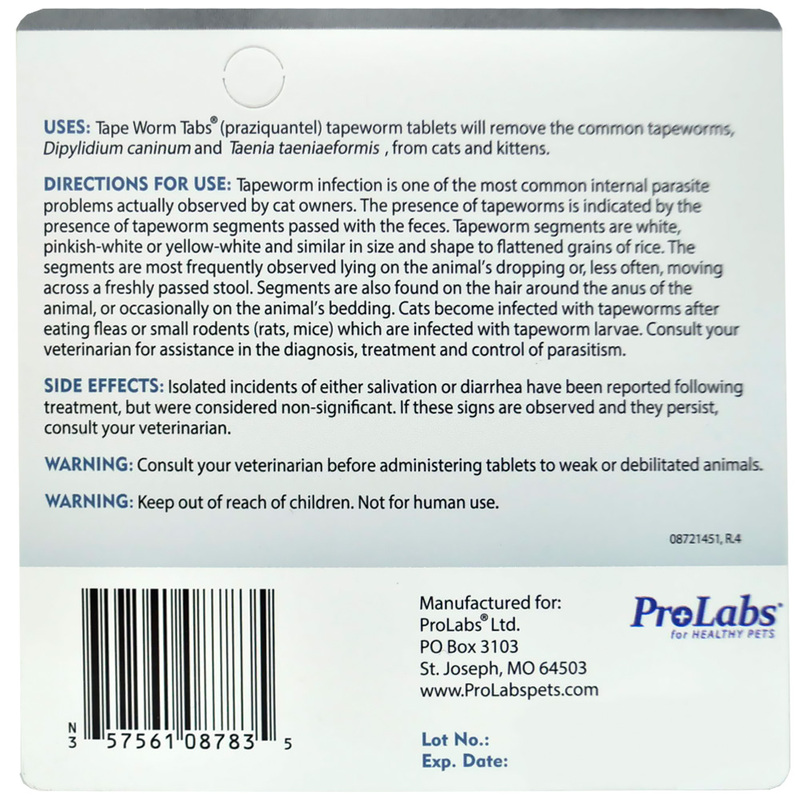 Tape Worm Tabs® (praziquantel) tapeworm tablets is 100% safe and effective in removing the common tapeworms, Dipylidium caninum and Taenia taeniaeformis from cats and kittens. Tablets sized for easy oral administration. May be given directly in the mouth, or crumbled and mixed with a small amount of the animal’s usual food portion. All of the tablet(s) must be eaten to remove all tapeworms. NOTE: Not intended for use in kittens less than 6 weeks of age.